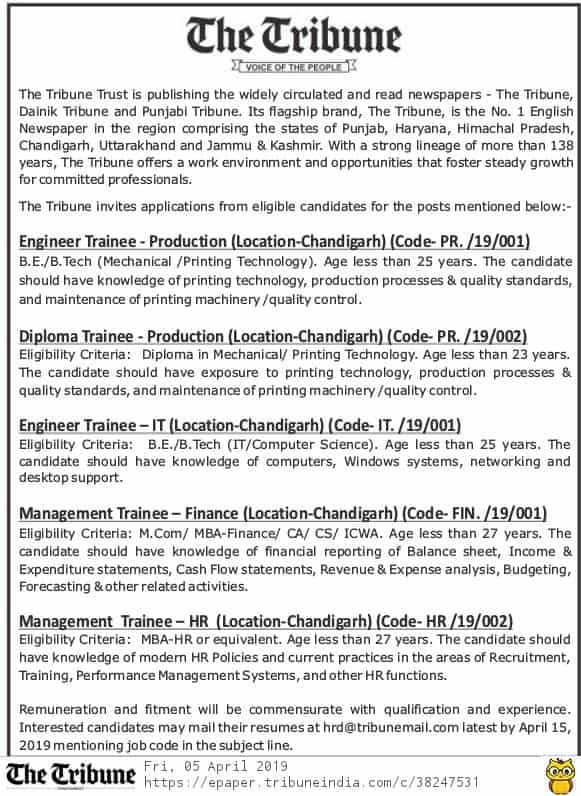 The Tribune Chandigarh has recently given notification of 05 Engineer Trainee, Diploma Trainee, and Management Trainee Vacancies. The interested candidates can apply for The Tribune Chandigarh Recruitment 2019 on or before 15.04.2019. Chandigarh The Tribune Recruitment 2019-20 notification is out. As per the Notification, there are 05 Engineer Trainee, Diploma Trainee, and Management Trainee Vacancies. The educational qualification is the Diploma, Graduation/ Post-graduation degree in the relevant field. The age limit is as per the Tribune Chandigarh norms. If you are looking for Jobs in Chandigarh then this article is going to be very helpful to you. Engineer Trainee – Production: B.E/ B. Tech (Mechanical/ Printing Technology). Age should be less than 25 years. The candidate should have knowledge of printing technology, production process & quality standards, and maintenance of printing machinery/ quality control. Diploma Trainee – Production: Diploma in Mechanical/ Printing Technology. The age should be less than 23 years. The candidate should have knowledge of printing technology, production process & quality standards, and maintenance of printing machinery/ quality control. Engineer Trainee – IT: B.E./ B. Tech (IT/ Computer Science). The age should be less than 25 years. The candidate should have knowledge of computers, windows systems, networking, and desktop support. Management Trainee – Finance: M.Com/ MBA Finance/ CS/ CA/ ICWA. The age should be less than 27 years. The candidate should have knowledge of financial reporting of the balance sheet, Income & Expenditure Statements, Cash Flow Statements, Revenue & Expenses analysis, Budgeting Forecasting & other related activities. Management Trainee – HR: MBA-HR or equivalent. The age should be less than 27 years. The candidate should have knowledge of modern HR Policies and current practices in the areas of recruitment, training, performance management systems, and other HR functions. The age limit has been given above in the qualification details. The selection is going to be on the basis of qualification and experience. You can send your applications through e-mail at hrd@tribunemail.com mentioning the post applied for in the subject column latest by 15 April 2019. You can check the Chandigarh Tribune Result or Interview List from the official website. Last Date: 15 April 2019. 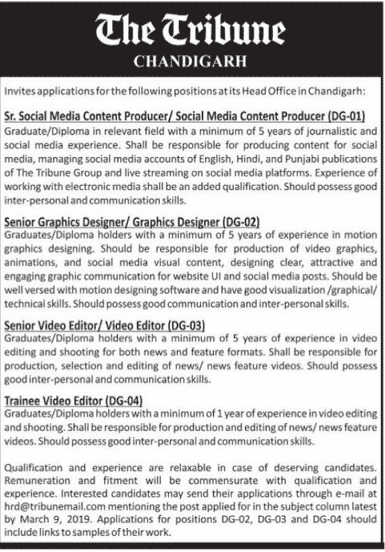 The Tribune Chandigarh has recently given notification of various Senior Social Media Content Producer/ Sr. Graphics Designer/ Sr. Video Editor/ Trainee Video Editor Vacancies. The interested candidates can apply for The Tribune Chandigarh Recruitment 2019 on or before 09.03.2019. Chandigarh The Tribune Recruitment 2019-20 notification is out. As per the Notification, there are various Senior Social Media Content Producer/ Sr. Graphics Designer/ Sr. Video Editor/ Trainee Video Editor Vacancies. The educational qualification is Graduation/ Diploma in the relevant field. The age limit is as per the Tribune Chandigarh norms. If you are looking for Jobs in Chandigarh then this article is going to be very helpful to you. The candidates should have the Graduation/ Diploma in the relevant field with the 05 years of working experience for the post of Sr. No. 1 to 3 and 01-years of experience in the relevant field. The selection is going to be on the basis of walk-in (written test). You can send your applications through e-mail at hrd@tribunemail.com mentioning the post applied for in the subject column latest by March 09, 2019. Applications for the post-Sr. no. 2, 3 & 4 should include links to sample of their works. Last Date: 09 March 2019. The Tribune Chandigarh has recently given notification of Trainee Sub-Inspectors/ Trainee Staff Correspondents Vacancy. 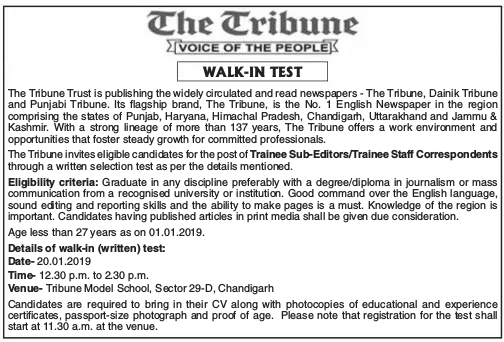 The interested candidates can attend walk-in-interview for The Tribune Chandigarh Recruitment 2019 on 20.01.2019. Chandigarh The Tribune Recruitment 2020-21 notification is out. As per the Notification, there is Trainee Sub-Inspectors/ Trainee Staff Vacancy. The educational qualification is graduation in any discipline. The age limit for the job is 27 years. If you are looking for Govt. Jobs in Chandigarh then this article is going to be very helpful to you. Name of Department: The Tribune Chandigarh. Date of Interview: 20 January 2019 at Tribune Model School, Sector 29-D, Chandigarh. Graduation in any discipline preferably with a degree/ diploma in journalism or mass communication from a recognized university or institution. Good Command over the English language, sound editing and reporting skills and the ability to make pages is a must. Knowledge of the region is important. Candidates having published articles in print media shall be given due consideration. The maximum age limit is 27 years as on the 01.01.2019. You can attend walk-in-written test on 20.01.2019 from 12.30 pm to 02.30 pm at Tribune Model School, Sector 29-D, Chandigarh. You have to bring your CV along with the photocopies of the educational and experience certificates, passport-size photographs and your age proof. The registration for the test shall start at 11.30 am at the venue. 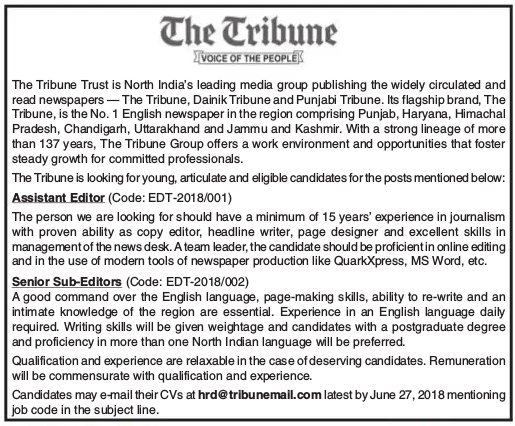 The Tribune Chandigarh has recently given notification of 02 Assistant Editor and Senior Sub-Editor Jobs. The interested candidates can apply for The Tribune Chandigarh Recruitment 2018 on or before 27 June 2018. Chandigarh The Tribune Recruitment 2018-19 notification is out. As per the Notification, there are 02 Assistant Editor and Senior Sub-Editor Vacancies. The educational qualification has been stated below kindly read the educational qualification para to read it. The age limit for the jobs in The Tribune is as per the department rules. If you are looking for Govt. Jobs in Chandigarh then this article is going to be very helpful to you. Assistant Editor: The candidate should have minimum 15-years of experience in journalism with proven ability as a copy editor, headline writer, page designer, and excellent skills in the management of the news desk. A team leader, the candidate should be proficient in online editing and in the use of modern tools of newspaper production like Quark Xpress, MS Word etc. Senior Sub-Editor: The candidate should have good command over the English Language, page making, ability to re-write and intimate knowledge of the region are essential. Experience in the English language daily required. Writing skills will be given weightage and candidates with a postgraduate and proficiency in more than one North Indian language will be preferred. Remuneration will be commensurate with qualification and experience. You can send your CVs at hrd@tribunemail.com mentioning job code in the subject line on or before 27.06.2018. Last Dates: 27 June 2018. The Tribune, Chandigarh has given notification of 03 Deputy Manager and Assistant Manager Vacancies. The interested candidates can apply for The Tribune Chandigarh Recruitment 2018 within 15 days from the date of advertisement. Chandigarh The Tribune Recruitment 2018-19 notification is out. As per the Notification, there are 03 Deputy Manager and Assistant Manager Vacancies. The educational qualifications are MBA/Post-Graduate and Graduation degree. The age limit is as per the department norms. If you are looking for Jobs in Chandigarh Tribune Newspaper then this article is very helpful for you. Deputy Manager: MBA/Post-Graduate/ Graduate Degree with minimum 10-years of experience of working in Media/ Services/ Consumer Products Industry. Shall be responsible for increasing advertisement revenue and achievement of targets. Should possess good communication and interpersonal skills with an in-depth understanding of the local market. Assistant Manager: MBA/Post-Graduate/ Graduate Degree with minimum 07-years of experience of working in Media/ Services/ Consumer Products Industry. Must possess business management skills with good working knowledge of MS Excel and power point. Should be comfortable with data handling and basic business analytics. Remuneration and fitment will commensurate with qualification and experience. You can send your resume at hrd@tribunemail.com mentioning the post applied for in the subject column latest by 03.04.2018. Last Date: 03 April 2018.